Note: We’re pleased to see that Sputnik news covered the event as no US corporate media mentioned it in their reporting. It seems that the people in power, including the media, do not want the public to know that the peace movement is growing. The next important US event is the Peace Congress which will be held in Washington, DC on November 10 at the Capitol Hill Presbyterian Church, 201 4th St., SE, Washington, DC, Fellowship Hall. The Peace Congress to end wars at home and abroad is part of a weekend of activities that replaces the Trump Military Parade which a coalition of more than 250 organizations helped to stop. After a morning plenary to set the stage this will be an all day general assembly to discuss how to build the peace movement, opportunities and challenges the movement faces, roles we can all play in building a peace movement, define short-term, medium-term and long-term goals as well as next steps we can take together. A massive antiwar rally started on Sunday in national capitals’ closest suburb, a Sputnik correspondent reported. Hundreds of people participate in Women’s March on Pentagon rally to voice their protest against aggressive US foreign policy. The march dedicated to the 51st anniversary of the big rally of 1967, when dozens of thousands of people gathered near Pentagon to protest against the war in Vietnam. The new rally was organized “In response to the ongoing US military aggression across the globe and the continuing bi-partisan increases in Pentagon funding,” its facilitators said. “Our demands are simple: The complete end to the wars abroad; closure of foreign bases; dramatically slash the Pentagon budget to fund healthy social programs here at home: the only good empire is a gone empire,” they said in a statement. The march is endorsed by a dozen organizations, including Green Party US, The United National Antiwar Coalition, The Black Alliance for Peace. 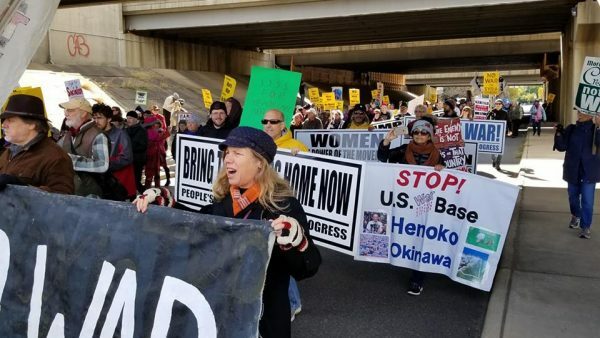 Sputnik reporter Alex Rubinstein was on the ground for the 2018 Women’s March on the Pentagon and was able to speak to protest organizer Cindy Sheehan and director Bonnie Caracciolo. Sheehan’s son was killed in Iraq in 2004. Sputnik: Is the march primarily addressing US wars overseas as a women’s issue? Sputnik: How does the peace movement coincide with your experience as an American with a family? Why did they stand around listening to songs and speeches? After coming all that way why didn’t they go the rest of the way and make some news? Block some doorways or surround something, or something, anything newsworthy!! I bet this didn’t get any coverage. However, maybe they made connections with one another and will build their communication and education links. (and, p.s., and anyway how come men were doing the drumming and singing, etc.if it was a women’s march? Hunh? In case you haven’t seen any of the films or photos- the majority of people were older women, some in wheelchairs, many disabled people and small children! You sound like you should be working for the Pentagon and recruiting people to shed blood when you yourself are OBVIOUSLY not willing to do so! Sadly, your premise is hollow. Your gratuitous insult is offensive. Therefore I will not engage with you.